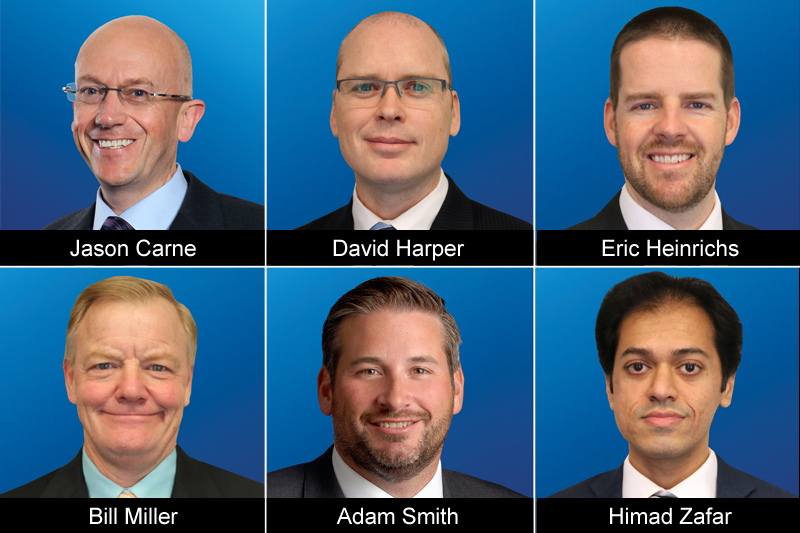 KPMG in Bermuda today [Jan 11] announced the retirement of Jason Carne from the firm’s Managing Director group and the promotions of Eric Heinrichs, Bill Miller, Adam Smith, Himad Zafar and David Harper to the firm’s leadership team. Mr. Carne joined the firm in 1992 and has been a Managing Director within KPMG’s Insurance practice for 18 years, most recently leading the firm’s Insurance Linked Securities team. In addition to his client service responsibilities, he served as the Managing Director responsible for KPMG in Bermuda’s People, Performance & Culture [PP&C] programme, charged with developing the firm’s Human Resources and Learning & Development policies and processes. In this role, he played an active part in setting the firm’s People agenda, spearheading hiring, development and training of Bermudian and overseas staff. Bermuda Chairman, Neil Patterson, praised Mr Carne for his 24 years of committed service to the firm, his clients, and Bermuda’s business community. “Jason has made a tremendous contribution to KPMG and to the Bermuda business community as a whole,” Mr Patterson said. “A respected voice on the international stage, he has built an enviable reputation in his areas of expertise, and his support of Bermuda’s Insurance Linked Securities initiatives will be a true legacy across KPMG and the Island. “Over the years, Jason has successfully acted as the lead engagement or quality control partner on many of our largest and most technical clients, including a number of SEC registrants and UK listed entities, as well as providing a wide variety of Advisory services to our clients. KPMG also announced the promotion of Eric Heinrichs and Bill Miller to Managing Director and Adam Smith, Himad Zafar, and David Harper to Director. Commenting on the new promotions, Mr. Patterson said: “We are delighted to announce these promotions and to welcome Eric and Bill to our team of Managing Directors. Both bring a wealth of experience, industry knowledge and expertise and their commitment to delivering quality service is apparent in the strength of their client relationships. In addition, Bill is the first Actuary to be promoted to the role of Managing Director in our Firm’s history. Mr Patterson continued “Succession planning is very important in our business and Adam, Himad and David have developed expertise across a range of industry sectors with a deep understanding of the key issues affecting our clients. “We are confident about the future of our firm and with these leadership appointments we have the right people in place to support the future needs of our clients and to continue to drive our business forward”.